Yesterday, we had the opportunity to work with a new client, Command Management Services, which primarily works with the government sector in providing lodging, meal services, transportation, security, technology solutions, and contract management capabilities. The company operates in more than 50 markets nationwide. For our Portland corporate video production, CMS was looking for an internal video to show to military recruits the night before their journey to the next step of the process. Like many training videos or internal video productions, the goal is to standardize operations across a wide area so that whether a recruit comes through a CMS Spirit Lounge in Portland, OR, where we shot the video, or in San Diego, CA, they are given the same information. 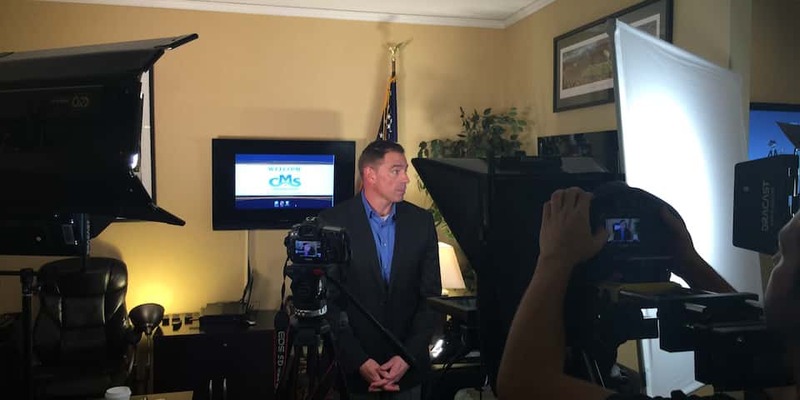 For our CMS corporate video, we hired a talented local actor, Dan Kyle, with previous military experience and experience playing military roles for television and film. Not only was Dan’s experience a perfect match for the job, but his talents as an actor will help make the message clear and valuable to future recruits. We also hired a local teleprompter operator with equipment to make the long speech easier to deliver and more focused for our actor. Working with a teleprompter is a great way to save time on set overall and make sure your message is delivered exactly as you want it to be, rather than “close enough.” Our talented videographer made sure lighting was perfect for the shoot and that the video looks fully professional. For editing purposes and variety, we filmed with two Canon 5D Mark III cameras, one in close-up and one on a medium shot. The two angles allow us to cut out of one take into another, which makes assembling the best possible delivery of the speech much easier in post-production. No actor will deliver every single line perfectly in the same take, especially when it is a 4-5 minute piece, so being able to cut to and from different takes is essential to creating the highest quality video production. Additionally, if any slight audio issues in the background occur at certain points, we’re easily able to switch to an alternate take. Visually, cutting back and forth between two angles is also a nice look and makes for a more professional video. We had a lot of fun working with Command Management Services, whose staff made everyone feel comfortable and provided some good laughs, too. Though much of my job involves producing videos from afar and dealing with company oversight, being on productions is a great break from office work and helps keep me engaged in the needs of our clients. Fortunately, Portland corporate video production is made easier by the wealth of crew talent available and actors like Dan Kyle. Working with great clients like CMS is also a nice bonus!